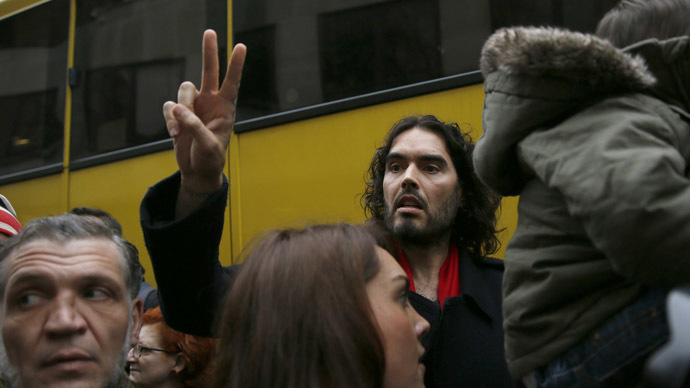 Self-styled revolutionary and comedian Russell Brand led a “sleepover protest” in a “critical” North London estate this week, where housing activists reoccupied their old homes. Annington Property Ltd, the owners of Sweets Way in Barnet, North London, recently evicted tenants to make way for a new housing development. Large crowds gathered on the estate on Tuesday to show solidarity with former tenants and those on the verge of homelessness. With a lack of affordable homes left in Barnet, “Annington should not be allowed to bulldoze our homes to make luxury flats,” Brand said on his website. Sweets Way evictee Dilem Kurt was forced to leave the estate and move into emergency accommodation with her parents and her 10-year-old brother in February. She told Times Series News her family will have to relocate again on April 1. Speaking to RT, Liam Barrington-Bush of Sweets Way Resists said: “It has been amazing to see how people of Sweets Way have come together. Bush says they will make it “impossible” for the council to demolish their community. Despite the council’s approval of regeneration plans, Annington will fail to provide sufficient affordable homes for residents in the area. The inclusion of 20 percent affordable homes will see a minimum of 59 created, where there were none before, according to the spokesman.